Jay Lichty, part of the first cohort of luthiers behind Luthiers for a Cause, will host the Mountain Acoustics Luthier Invitational on May 24-26, 2019. 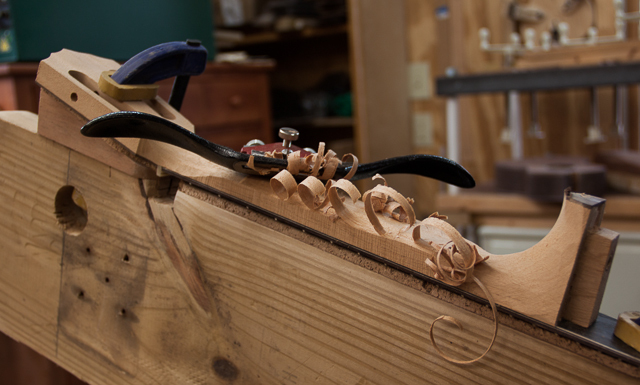 The event will bring together more than a dozen master craftsmen in Burnsville, North Carolina. Luthiers for a Cause is proud to sponsor this landmark event, which features some of the nation’s finest artisans of acoustic, stringed instruments including guitars, mandolins, ukuleles, violins, banjos, dulcimers and more. The weekend also includes an evening concert by Kaki King at the historic Parkway Playhouse Theater. Six of the world's most distinguished instrument builders have come together to showcase their unique building approaches and to make a lasting difference in the lives of sick children. Each luthier will build a tenor ukulele out of wood sourced from two trees that are legendary among acoustic guitar and ukulele enthusiasts. All of the proceeds from the sale of the instruments will go to benefit The Ukulele Kids club, a 501(c)3 non-profit whose mission is to harness the healing power of music by sending hospitalized children home with the gift of music for life. Several luthiers and friends were discussing an often-asked question in the acoustic instrument world, "How much does the wood contribute to tone and how much does the luthier contribute?" The challenge to answering this question stems from the fact that there is great variability from tree-to-tree in the same species. They quickly agreed that they would need to constrain the source to a particular tree. Excited, they agreed that if they could get half a dozen of the world's best luthiers to each build a tenor ukulele from the same exact tree, it would allow the world to see and hear the unique aesthetics and tonal voicing each brings to virtually identically wood sets. The group determined right away that such an interesting project could be used to educate, to entertain and to raise money for a charitable cause. Thus, Luthiers for a Cause was born. These exceptional instruments have been completed and were unveiled at the Hawaii Ukulele Festival. Check out The Ukulele Review video podcast below, which includes a discussion with the luthiers and sound samples. Follow our social media activities (links in footer) and the News section on this site. To make sure you don't miss a thing, sign up for our newsletter on the Contact page or follow us on Facebook. Learn more about the work of the Ukulele Kids Club.